This great Lake Michigan fishing charter boat calls Northpoint Marina, Winthrop harbor, Ill..it’s home. Located one hour North of Chicago, Northpoint Marina is Lake Michigan’s largest Marina and home to a very large fleet of Charter Fishing Boats. Early Spring it is unrivaled for its Coho fishery. Charter Boats from all over Northern Lake Michigan bring their clients to this great port for the great Coho action right out of the harbor. Being so close to Chicago is also a great benefit of Northpoint Marina. Our floating docks also make boarding access very easy and safe. Being close to deep water is one of our great lake features. Being located closer to the fishing grounds which means less travel time & more fishing time. Parking is free and convenient. For directions please go to the Confusion’s Directions page. 33 Foot Long Tiara Custom Express Sport fisherman The “Magnum”, is an excellent Sport fishing vessel. This Lake Michigan Charter Boat is almost 13 foot wide & built solid to ride comfortably on big water. 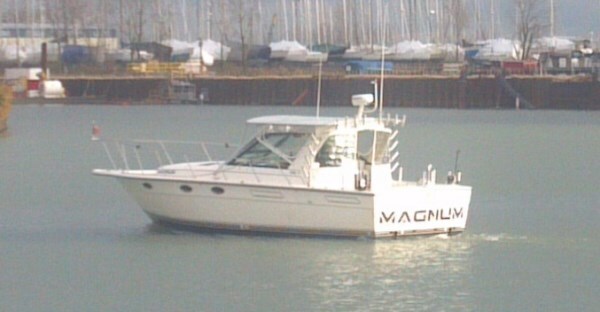 The “Magnum ” is also very fast and can get to the fishing grounds faster than most boats. 2012 this boatwas launched with great success It features a custom built Fiberglass hard top that provides greater comfort and stability along with better weather protection to the vessel. Features are made for comfort & full amenities including enclosed washroom facilities and safety equipment.